Use one of my barbecue marinades and transform your meat so that it melts in the mouth. My guide below will help you select the right marinade for whatever meat your are grilling or smoking. First - It tenderizes the meat. This is extremely important with beef when using the lower cost cuts such as chuck steak and even then I don't recommend grilling, it really is one for the smoker. Second - a marinade can be used to flavor meat and this is evident in a lot of my Asian influenced marinades. When flavor is king you'll often find me recommending that the marinade is used to baste the meat during the cooking process too. These two words are often confused. Marinate - A verb that means to soak food in a liquid. A marinade can work in a number of ways but the end result is the same. The peptide bonds in the outer layer connective tissue (collagen protein) are denatured, water is released and the "dehydrated" remains of the connective tissue are easier to chew therefore giving the impression of tenderness. So to be clear, a marinade works on the outer layers of connective tissue, it does not work on the meat itself and will not penetrate deep into the meat. Barbecue marinades affect no more than 0.1mm in depth from the meat surface but that is enough to give the sensation of tenderness. Papaya contains an enzyme called papain and pineapple stem has a similar compound called bromalein. Both break down collagen protein and allow flavours to penetrate deeper into meats. A good source of bromalein is the juice of canned pineapple. That said the longer you leave meat in either of these enzymes, the more mushy it will go even to the point where you would not want to eat it. Use these marinades for 30 minutes before cooking and you will have a soft bite to your steak but still firm enough to enjoy the flavour. Citric acid is a great way to add flavour to meat and tenderise but similarly to enzymatic action you don't want to leave the marinade on for more than 2 hours otherwise the acid will tighten the protein bonds on the surface of the meat and start to toughen it. The calcium in yogurt activates enzymes which break down the meat proteins in meat. It is also a mild acid which helps tenderise rather than toughen meat. A yogurt marinade is the one exception to the two hour rule. I tend to use yogurt based marinades in my Indian recipes and when using these marinades I often refrigerate and leave overnight. Note:- Technically there is a fourth "salt" marinade however to my mind this is a brine. Brines work in a different way and as such there are significant difference in how to marinade and also when you might choose to use a marinade. Use a marinade to tenderise meat for anything between 30 minutes and 2 hours. Do not refrigerate whilst using a marinade. Leaving meat or fish out of the refrigerator for a short time prior to cooking is not going to cause spoilage, in fact I think it helps the cooking process by making it easier for the core of meat to get up to temperature, especially when searing. 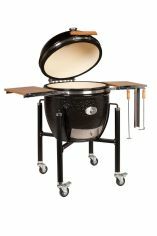 In addition refrigeration slows down the action of a marinade by tightening muscle tissue. Note:- Yogurt based marinades are the exception to both these rules and if marinading for more than two hours you must refrigerate but still give your marinade a last hour at room temperature before cooking. Generally speaking you’ll need about 150ml / ¼ pint of marinade for every 450g or pound of meat. Oily marinades are good for dry lean foods such as fish and acidic citrus / vinegar based marinades work best on red meat and richer fatty foods. TIP - Use a shallow non metallic bowl. This means that the meat will lie in a single layer and we get the maximum effect. There's always a danger that the acid in a marinade will react with a metal bowl giving a metallic flavour to your food so it's always better to avoid metallic bowls. The exception to this is stainless steel. I've included two basic barbecue marinades below and then check out all my other barbecue marinade recipes. This first basic barbecue marinade is perfect for both meat and fish. This Red wine marinade is directed more at the richer flavours such as red meat and game. In each case it's simply a matter of mixing the ingredients up and follow my general rules how to marinate and you're ready to go. Garlic Grilled Chicken Marinade - Similar to the one above but more garlic and with a novel way of application that makes for a quick result. Italian Grilled Chicken Marinade Recipe - and stuff this under the skin of a spatchcocked chicken too. California Jerky Seasoning Recipe - If Jerky is your thing then this marinade is perfect for homemade. Balsamic Marinade - Typically Mediterranean, it brings lamb alive! Cointreau Marinade - Sweet and full of orange flavour this goes really well with duck. Barbecue Goose Marinade - For the whole Goose. Change your bird this Yuletide season. Mint Marinade for Lamb - Traditional and one of the best. A Grilled Lamb Recipe - including a fragrant marinade of red wine and rosemary. 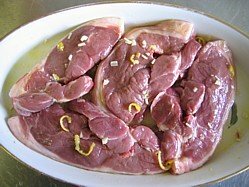 Traditional Greek Marinade - Perfect for lamb and try it with pork too. Grilled Pork Chop Marinade - A brine infused with garlic, chili and sugar. Turkish Style Grilled Chicken Marinade - For best results this one needs an overnight soak. Tandoori Marinade - A hot barbecue and this spicy yogurt marinade transforms pieces of chicken. Chicken Tikka Marinade - Bring out those authentic Indian flavors. Spicy Indian Marinade for Pork, Lamb or Chicken - whatever your choice of meat, it's a hot one! Chuck Roast Marinade - designed to tenderize. Thai Spiced Marinade Recipe For Grilled Shrimp - hot and sweet, just as you'd expect. Teriyaki Marinade for grilled salmon. Ginger and Lime Marinade - Great with all white fish and one of my favorites for monk fish or shrimps. Olive Oil & Garlic - Works well with any white fish but why do I always come back to a monk fish tail? 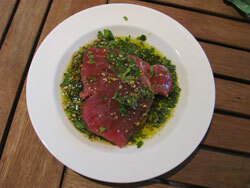 Citrus Marinade - citrus fruits abound in this seafood marinade. As mentioned earlier, brines are different to barbecue marinades, they work in a different way and achieve different results. There's a separate section on the website dedicated to brine recipes.